Valentines doesn’t always have to be for lovers. It can be for all of us, we can share the love with our family, our friends, our beloved pets and even our colleagues! 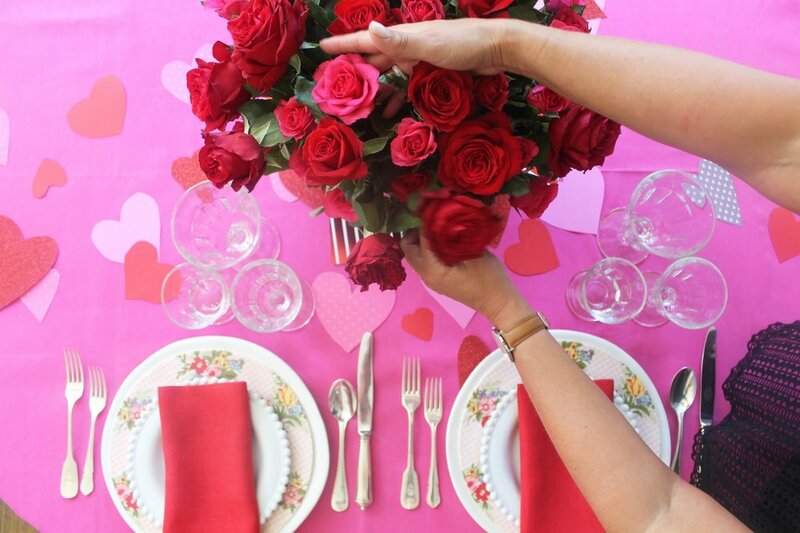 Over the years I have created some gorgeous table settings, home made gifts and meals to celebrate Valentines Day. From a bathroom filled with Roses and champagne, a delicious Eton Mess served to my beloved, and of course small tokens of love to be shared throughout the year. So whether you are in a relationship or not, spread your love on this special day. Champagne, Chocolates and bubble bath. Wine, Dark Chocolate and a selection of cheeses. Beer, Salted Nuts and a favourite DVD to watch together. A variety of herbal teas, homemade cookies and a stack of favourite magazines. A bunch of flowers, body moisturiser and paperback love story. Fragrant candle, Spotify list of favourite love songs and a beautiful throw. A variety of coloured paper (I would suggest sticking to 1-2 colours and playing with various tones in this colour. Also having some patterned paper adds a fun touch). Take one sheet of paper and draw an outline of a heart to you liking. Once satisfied, gathered a handful of sheets and stack behind our outlined paper. Take your scissors and cut out the outline to create multiples of your heart. Repeat this process by experimenting with different sized hearts and colour paper. Paired with a vase full of beautiful red rose as the centrepiece with candles, I think this is such a lovely way to celebrate the day if you are planning on a quiet night in with your loved one. …And I’m not talking about the red ones that come in a plastic tube…I'm talking luscious armfuls of roses that arrive on your doorstep or at work with handwritten declarations of love. I just adore it. But it seems silly to me to wait for someone to give a gorgeous bunch of flowers (if you are even lucky enough to have a special someone that give them them to you), so, why not paint your home with flowers in prep for Valentine's Day instead? No matter your budget or how many vases you have, you can create a truly beautiful and inviting home this Valentine's Day. Now I will admit that I am a little flower obsessed, but this Valentine’s day I am going with a classic - THE ROSE. Roses are the ultimate classic. I love having bunches that are a variety of pinks amping up to reds - the ombre effect that flowers naturally create is just divine. And if there was ever an excuses to have flowers in the home, Valentine's Day is it!